In this Q&A video, learn about High Tech Careers at PowerObjects from Dave, CRM R&D Team Lead. Dave explains what makes our team unique, why he enjoys working with PowerObjects’s PowerPack Add-Ons, and what you can expect in a technical role on our team. Dave: Hi, my name is Dave Braun. I’m the CRM R&D Team Lead here at PowerObjects, and my team is responsible for bringing brand new PowerPack add-ons into the marketplace for Dynamics 365, and maintaining those throughout the lifetime of the product. Interviewer: As a technical expert, why do you enjoy working at PowerObjects? Dave: I enjoy working at PowerObjects from a technical perspective because PowerObjects is always on the cutting edge, the bleeding edge, of the Dynamics 365 technology. We get to do a lot of things that other people don’t necessarily get exposed to, and we get to be a leader in the field in that respect. Interviewer: So, what is most exciting to you, working within the Dynamics platform? Dave: It’s really exciting working within the Dynamics platform because right now the technology is changing a great deal. We’re seeing new things with Microsoft Dynamics AX. We’re seeing new things with Microsoft Azure, new things with Xamarin. Everything’s brand new, so we get a lot of opportunities to build cool things. Interviewer: Yeah. What are some of the hottest, most cutting-edge technologies that you’ve built within Dynamics 365? Dave: Some of the coolest things going on with Dynamics 365 right now is the Azure platform, and what we can do with other peripherals around that. So, things like machine learning, things like bot frameworks, things like cross-platform integration now, are very, very cool, and very, very cutting-edge. Interviewer: As a developer, why do you get excited about working with the new technologies you’ve built within Dynamics 365? Dave: As a developer, I like working with these new technologies because I enjoy trying new things and solving very, very difficult problems in the most efficient way possible. Part of learning with Dynamics 365 is learning how to do things in a new way and expanding your horizons. Interviewer: If you knew a technical expert who was considering a job at PowerObjects, what would you say to them? Dave: I would say that the sky is the limit. There’s a lot of different things that you can do at PowerObjects, and you don’t really have to fit into a niche. If you find something that adds value, and you think it will work for your client, try it out, and bring it to the table, and it’s probably going to be heard. Interviewer: As a developer, why do you like working for PowerObjects specifically? Dave: I enjoy working for PowerObjects because PowerObjects is always on the cutting edge of technology. We see brand new things every day, and I get to be challenged every single time I come into the office, and that’s an exciting thing for a developer. Dave: I came to PowerObjects through sort of a roundabout way. I was actually working for a local retailer in the lumber yard. A PowerObjects employee approached me to purchase some products and noticed that I was really fast on the keyboard, and offered me an opportunity to come and interview for PowerObjects. Since then, I’ve stayed with the R&D team for the past six years, and I’m loving every minute. Interviewer: So, can you tell us what PowerPack adds are, and how your team creates those? Dave: PowerPack add-ons are really cool because they’re a PowerObjects IP that the R&D team builds and maintains. They fill many needs within the CRM environment. It might be a marketing need, where a client needs to send MailChimp blasts or send a survey to their particular clients. They may do something simple, like simply putting a photo on a CRM form. They come from all sorts of places. We might have a client that needs a specific problem solved, and we generalize it and turn it into a PowerPack. We may have an employee that comes to us with an idea, and we generalize it and turn it into a PowerPack. So, they’re a really cool, cool product. Interviewer: Why is it fun for your team to work on creating PowerPacks? Dave: One of my favorite things about working with the PowerObjects R&D team is, we get to build new things and be innovative every single day. For example, our PowerPacks are brand new things that we build up from scratch, and we send them out to build our brand. Those ideas may come from a client who needs something fixed, and we can turn it into something very cool. It may come from an employee who thinks they’ve just got a good idea, and we turn it into something fantastic. Speaker 3: Tell us a little bit, like, your experience working with R&D team. Dave: Okay. I started working with PowerObjects on the R&D team, and I’ve become the Team Lead over time. One of my favorite things, one of the things that’s kept me with this team, is the collaboration and the freedom to really kind of try your own thing and make your own way. I really enjoy working with all the people at PowerObjects because information really isn’t sheltered or kept away from anyone. We’re very collaborative. We’ve got a bunch of great minds and experts on everything, and no one person can know it all, so sharing that knowledge is extremely important and critical to the success of what we do. Interviewer: From a developer perspective, how do you think you’ve evolved since your first day at PowerObjects? Dave: Sure. From a development perspective, I’ve evolved in many different ways working with PowerObjects, and a lot of that is, my skills have grown, and I’ve learned to look at my code and my solutions in very different ways because there’s not one answer for everything. There’s no silver bullet, so to speak. Interviewer: Yeah. What is a stand-out experience you’ve had working at PowerObjects? Dave: One of the great things about working with PowerObjects is you get a chance to try new things and push yourself outside of your normal comfort zone. For example, I recently went to India, Madurai, to train a brand new team of CRM developers to come and work with us as an off-shore team for PowerObjects. Interviewer: What makes PowerObjects unique? Dave: PowerObjects is unique because we do a very good job of merging high technology and very laid-back, relaxed culture, and I think it makes a very special environment for people to work in. February 22, 2018 Ashley Waalen	Be the first to comment. 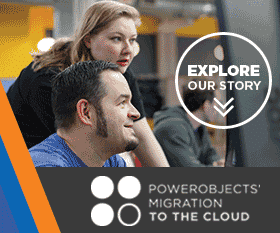 Watch this video to get an inside look and hear from some of our customers about why PowerObjects is the right partner for your journey. December 17, 2018 Alexandra Brown	Be the first to comment. The CRM Minute: CRMUG Summit 2016 Recap of Awesome! October 20, 2016 powerobjectsweb_o6z0dz	Be the first to comment. Take a look at all the fun we had in Tampa talking Dynamics CRM the CRM community at CRMUG Summit 2016!